EUGENE, Ore. – A total of 12 student-athletes from the University of Arkansas men’s track and field program will compete this weekend during the USATF Junior and Senior Championships, Jamaican National Championships, and Bahamian National Championships. All enter the weekend with hopes of making the national team and representing their countries at the 2015 IAAF World Championships in Beijing, China on August 22-29. The top three senior finishers will earn a spot on their national team if they have achieved the IAAF qualifying standard. Entry to the international team championship circuit includes the Pan Am Games from July 20-26 in Toronto, Canada and NACAC Championships from August 7-9 in San Jose, Costa Rica. USATF will select the top two finishers in each individual event to represent the country at the 2015 Pan Am Junior Championships in Edmonton, Alberta, Canada held July 31 – August 2. 2015 four-time outdoor All-American Jarrion Lawson opens up competition for the Razorbacks in both the long jump and the first round of the 100 meters on Thursday at the USATF Championships. Lawson is joined in the senior section of the championships by fellow All-Americans Andrew Irwin (pole vault) and Stanley Kebenei (3,000m steeplechase). In the USA junior section, the Razorbacks will be represented by four freshman in the field. Shot put will feature Memphis, Tenn. native Sam Kempka and Arkansas 7A state champion Jeff Rogers, both are first time qualifiers for the championships. Rubin Owens and Brandon Workman will be in action in the long jump. Owens who will also be competing in the triple jump, participated in the 2015 NCAA West preliminary round, jumping a season-best 14.95m/49-0.75. Ethan Moehn rounds out the Razorback’s USA junior entries set to run 1500 meters. A trio of Razorbacks head to the Jamaican National Championships, including NCAA champion and Bowerman semifinalist Omar McLeod. The Arkansas sophomore ran a world-leading time (13.01) in all-conditions in the final of the 110-meter hurdles at the national meet and is undefeated in the event this year. Kingston, Jamaica native Kemoy Campbell will take on the nation’s best at 5,000 meters. His career best time 13:20.39 is the fastest this year by a collegian. 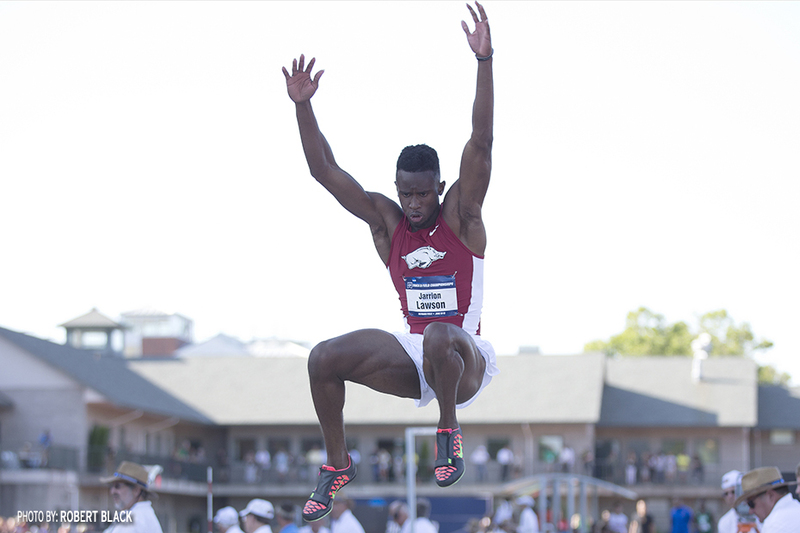 On the heels of his seventh-place finish at the 2015 NCAA Outdoor Championships, triple jumper Clive Pullen will be the only Razorback in the field at the Jamaican National Championships. Arkansas sophomore Trae Carey will be competing in the Bahamian National Championships in the long jump.